In the D5300, we saw a redesigned pentamirror system inside the viewfinder that allowed a 0.82x magnification compared to the 0.78x magnification in the D5200. This same specification is carried over to the D5500, resulting in a reasonably large and clear viewfinder. Just like the D5300, the D5500 has a 1.04-million-dot, vari-angle LCD. 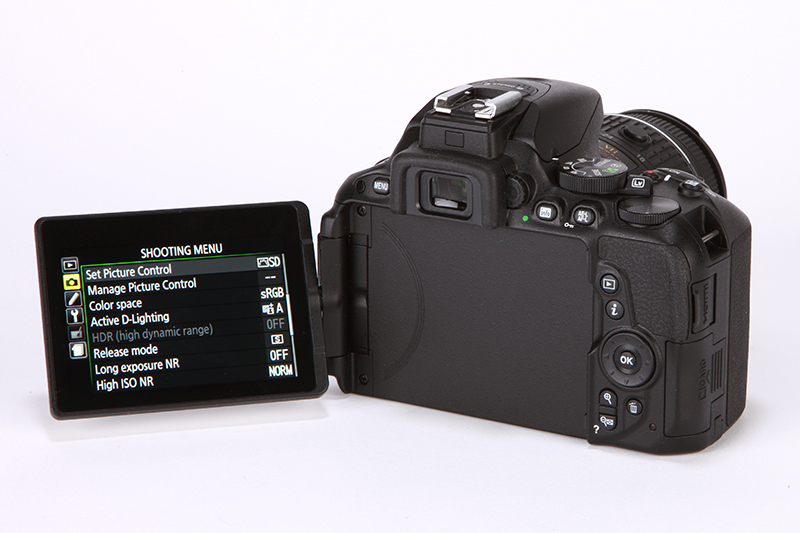 However, this screen now boasts touchscreen functionality, which greatly adds to the usability of the camera. Overall, the touchscreen is responsive and touch controls work very well. Video users will find the ability to change settings in video, without physical buttons, great as they won’t nudge the camera out of position and the button presses won’t be audible. Also, when using the vari-angle screen to shoot at high angles, the ability to tap the touchscreen to activate the shutter is a very welcome feature – though what I find most useful is pinch zooming to check focus quickly. In terms of resolution and colour, there’s nothing to complain about with the D5500. Colours are clear, punchy and true to the scene on the back of the camera, and the screen’s refresh rate is also very good. Overall, the screen resolution is on a par, or better than, most entry-level DSLRs.